Home buyers trying to find a single family home for sale under $400,000 in the Town of Mount Pleasant are often frustrated by the lack of homes in this price range, or by the condition/age of the homes that are available. Good news for those frustrated buyers! Planters Pointe neighborhood frequently has newer (built since 1995) homes in good condition on the market under $400,000. Currently there are 10 active listings under $400K. Some have updates! Lots are usually larger than those in the "new" subdivisions. 0.20 to 0.25 acre lots are not unusual. A few are even larger! Note: Some homes may need TLC. Planters Pointe is one of Mount Pleasant's best kept secrets! It's smaller than the neighboring communities of Rivertowne, Dunes West & Park West. Despite its size, Planters Pointe has a lot to offer. This well-maintained neighborhood has a beautiful clubhouses & Olympic sized pool. Residents can also play tennis, watch their kids on the tot playground or enjoy the fitness walking trails equipped with exercise stations. All for the low annual HOA fee of $675.00. Planters Point is comprised of several sub-neighborhoods. Three neighborhoods are located off Rivertowne Parkway while the others are accessed via their own entrance off Hwy 41, just past the Harris-Teeter Shopping Center. Price range and home size varies from one mini-neighborhood to the other. Some have sidewalks; some have lots situated on quiet cul-de-sacs; other lots may back up to protected woods, ponds or marsh. Current price range is from $303,000 to over $600,000. Square footage ranges from around 1230 to 3600 sq ft.
1. Several are story homes. 2. All have 1 or 2 car garages. 3. A few have screened porches. 4. Square footage ranges from 1234 to 2209 SF. 5. Three homes have 4 bedrooms. 6. Seven homes have 3 bedrooms. 2888 Vanguard Place - $379,000. 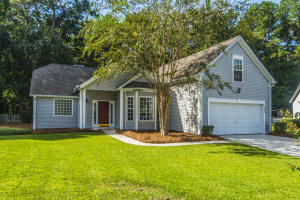 One story home with 2057 sq ft, 2 car garage, FPL, & Screened Porch. This 4 bedrooms features 3 bedrooms on 1st floor and a 4th bedroom or bonus room on 2nd level. Updates includes new HVAC, wide plank flooring, & stainless steel appliances. Lot is spacious - 0.31 acre - and is located on a quiet cul-de-sac. Home backs up to a protected wooded area. Call Mary Carson 843.300.5643 ~ Carolina One. Real Estate.